We all have been hearing about BB creams for over a year now, with more and more brands launching one and now there are CC creams and jokes flying around about ZZ creams. I subscribe to the way of thought that while one needs to walk in step with the times, you equally shouldn’t rush into doing things, even if others are doing it, unless you are ready. There have been rumblings about Ren Clean Skincare launching a BB cream for a good few months and I even heard a launch date of June 26th being tossed around, but apart from a few bits of information from the beauty insiders, I didn’t know much and as I never write things based on just a press release, guided by the proverb ‘good things come to those who wait’, I patiently waited. Luckily for me I received the cream a few weeks back, so have been testing it to my heart’s content an am ready to tell all on the week of the official launch ! Ren Clean Skincare is the British brand that has a well recognised identity ( it was launched in 2000 ) and I love many of the brand’s products, from their Vita-Mineral Radiant Day Cream & Frankincense Revitalising Night one, to my absolute daily must Photoactive Sun Veil SPF 15 and Ren Micro Polish cleanser that always delivers a dose of radiance to the skin and never lets me down. The latest and much anticipated launch, Satin Perfection BB Cream SPF 15 is silicone free and not only that, it is a wonderful multi-tasker that is perfect for warm spring and summer months. It corrects imperfections, gives anti-oxidant protection, tones and firm facial contours ( even around the jaw line ) and boosts skin’s luminosity and radiance, as well as making you face feel baby soft to the touch-are you impressed yet? Women love products that can multi-task and this one will do just that for you in the morning, replacing the need for primer and foundation to start with. It acts as a perfect canvas for your make-up and lets your skin breath, so you don’t feel like you are wearing a mask that starts sliding a few hours later, requiring you to dash into the bathroom in the office or at home to re-apply. The cream itself, like a light-textured mousse, smells of sunshine, oranges and grapefruits on a glorious day, so don’t be surprised if you break into a happy humming as you gently tap it around your face. It sinks in very quickly, without the need to rub it in or drag the skin as you apply it and it makes your skin feel instantly soft and even to the touch, with pores being less visible. I have to say that as it states on the bottle, it is suitable for light to medium complexions, but you can always add some bronzer on top to make it darker , if necessary. –Fluorophores: originating from Noni Extract ( noni is an evergreen tree that grows in the Pacific, Australia and India, often in the areas where lava flows and for years it has been known for its various medicinal properties and is used in skincare because of its anti-ageing and moisturising properties ) it helps to boost skin’s elastin production ( by harnessing UV light and changing it into beneficial red light ), thus leading to the improvement in the tone and firmness of your skin. While it’s not going to erase the lines, it will certainly soften them and make them less prominent. –Antileukine: derived from Ochroleuca Seaweed, it protects your skin from harmful sun rays and UV damage, as well as boost the levels of anti-oxidants in your epidermal layer. –Tocotrienols: extracted from Arctic Cranberry Seed Oil it offers antioxidant protection, which is essential during warm months of the year when the sun is at its most active. When using this product I skip using Ren’s Sun Veil, which has been my faithful make-up essential for a couple of years now. I call it simplifying skincare regime without compromising on essential requirements! –Vitamin C/Magnesium & Glycogen ( from Marine Glucose ) will help to boost luminosity and radiance of your skin, which let’s be honest, we all start loosing from late 20s. Another bonus of this particular BB Cream is that is contains natural mineral pigments that while being light-weight when it comes to the sensation you feel upon application, also boast adaptive colour technology which works together with your skin tone, so you are more likely to see a natural-looking result, rather than a streaky one. Silica, which adds soft focus to the skin and Mica, which reflects light, also have an added benefit of absorbing and controlling oil production, a definite plus if you have oily skin prone to unwanted shine. What I also love about Ren skincare is that it has high-tech products that smell beautifully and they nurture and care for your skin, while not costing you an arms and a leg. Good & safe skincare should be a basic human right, as skin is our biggest organ and everything that goes through our pores zooms into our blood stream. Personally I don’t think that we should pay a huge amount of money ( Harrods stocks up a diamond cream with the price tag nearing £500 ) in order to have beautiful and healthy skin and Ren delivers every single time it launches a new product. I have been wearing this BB cream almost every day lately and consider it to be part of my beauty routine a la casual chic-a multitasker that nurtures my skin, hides the imperfections, while letting the skin breath, and makes me feel pretty in the understated yet groomed way. 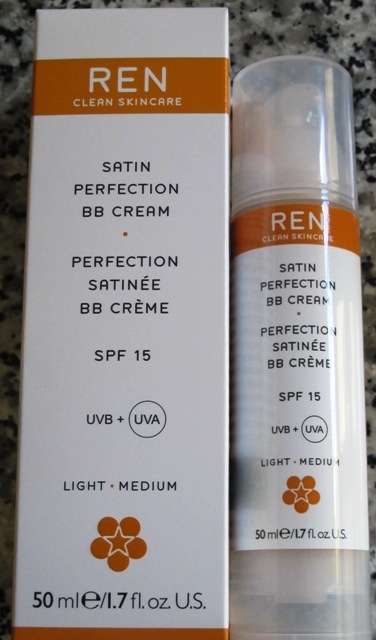 Ren Satin Perfection BB Cream SPF 15, UVB+UVA, for light/medium skin tone, 50 mls, £26 Should be used within 9 months of opening. Suitable for all skin types.